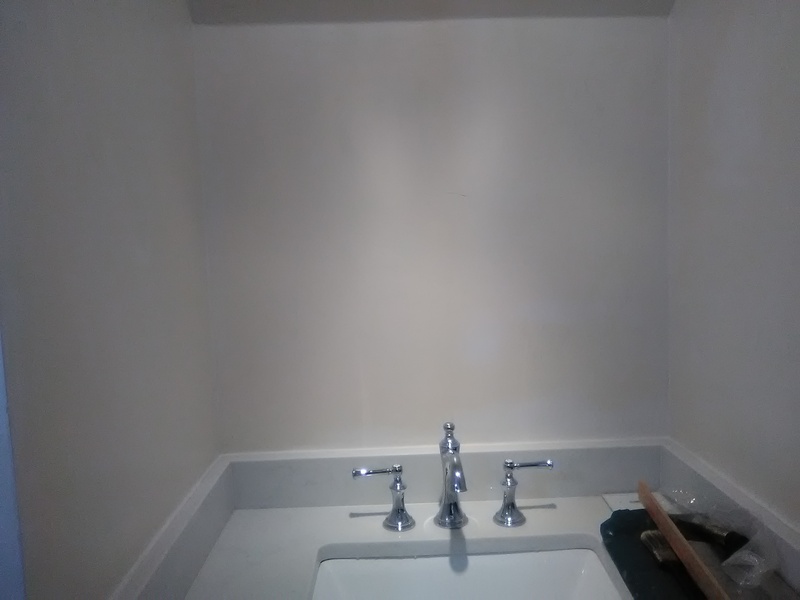 OK, so my original whole-room photo of the “before” powder room didn’t take. But in the top photo here, at least you can see the dark color that the windowless room was covered with. Actually, this faux-finish pattern and dark color was a good look for back in the ’90’s when this townhome in the Briargrove / Tanglewood neighborhood of Houston was built. But the homeowner now wanted a brighter room; she was leaning heavily toward black & white, with some hits of red tossed in. 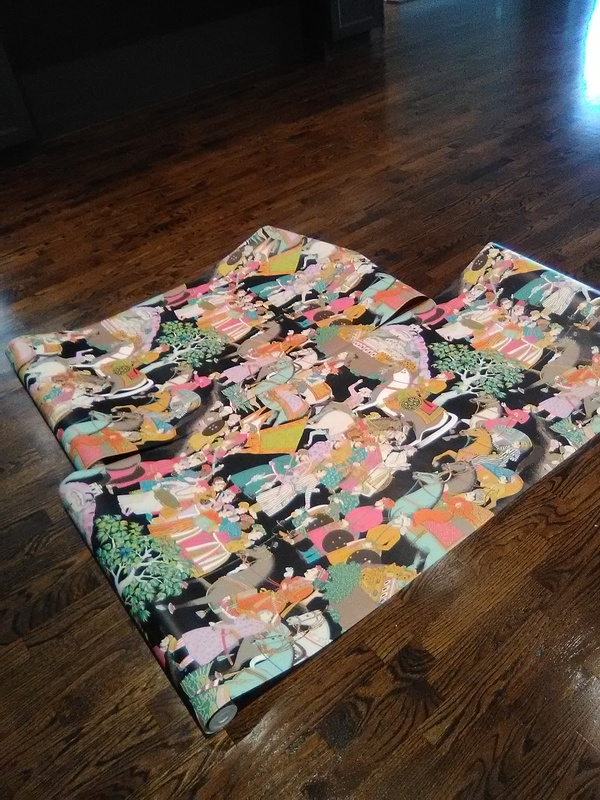 I stripped off the old vinyl wallpaper (those photos didn’t turn out, either! 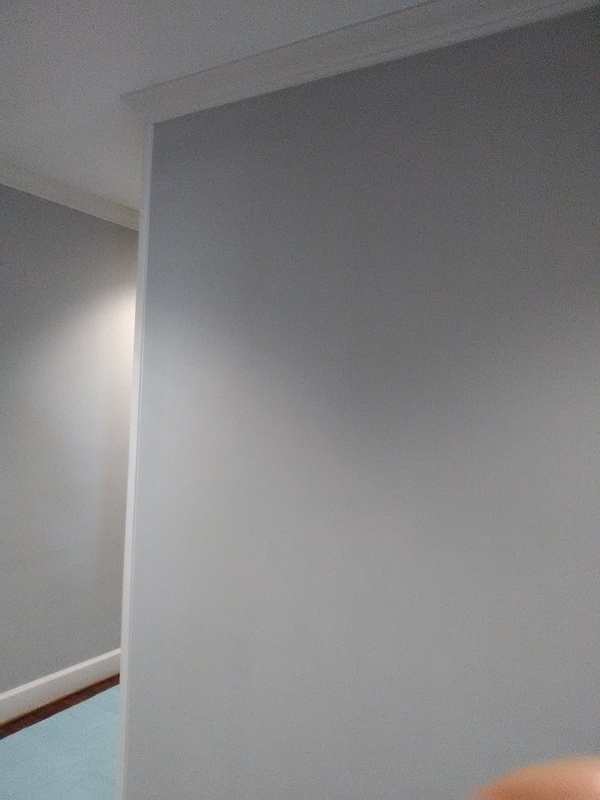 😦 ), then patched areas where the old paper had pulled paint off the wall, sanded smooth, and then primed all surfaces with Gardz. 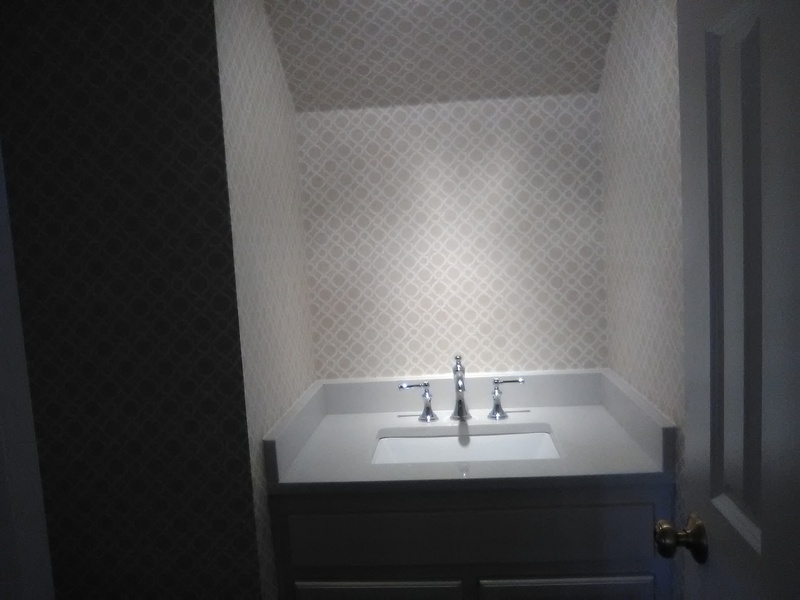 The homeowner is completely in love with the new paper and the new, bright powder room. She will accent with a mirror in a wide black frame, and with some custom-painted artwork that will incorporate touches of black, white, and red. 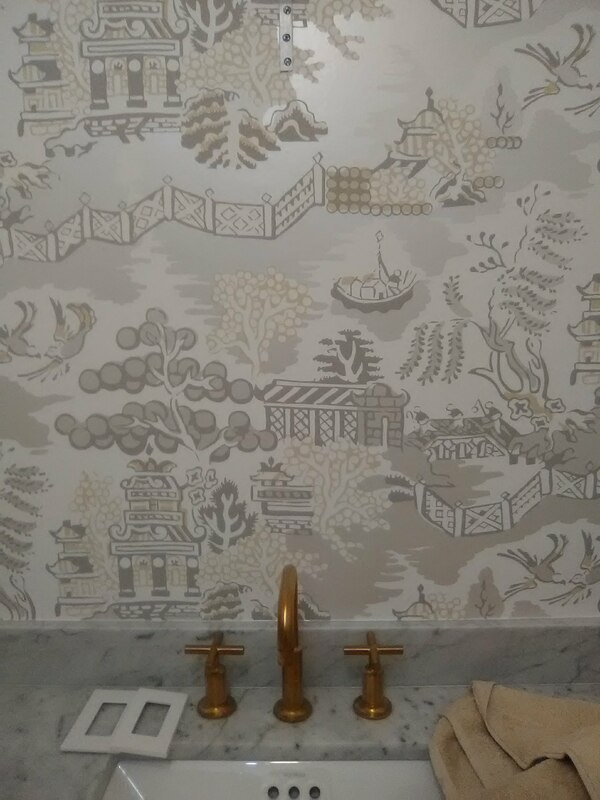 This wallpaper is by Cole & Son, a British company. 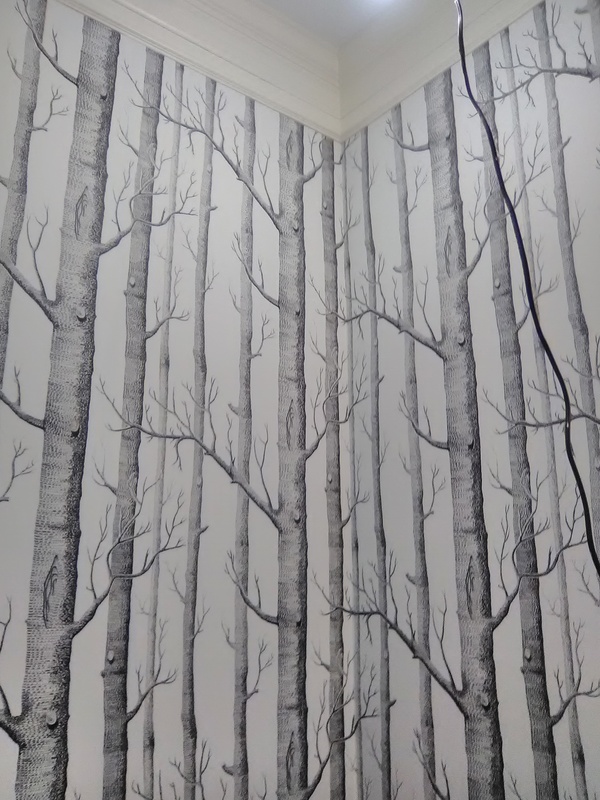 It is a very popular pattern called “Woods.” It’s on a non-woven substrate, which has a fiberglass component to strengthen it; it is designed to strip off the wall easily and with minimal damage to the wall, when it’s time to redecorate It is a little more cleanable than a paper-wallpaper. The original paper wasn’t exactly what you would call exciting, but it had served well – for about 30 years. Now, in 2019, it was time for an update! The homeowner (who had lived happily with these pale walls for decades) knew she wanted a dramatic paper, and she was dead set on black. 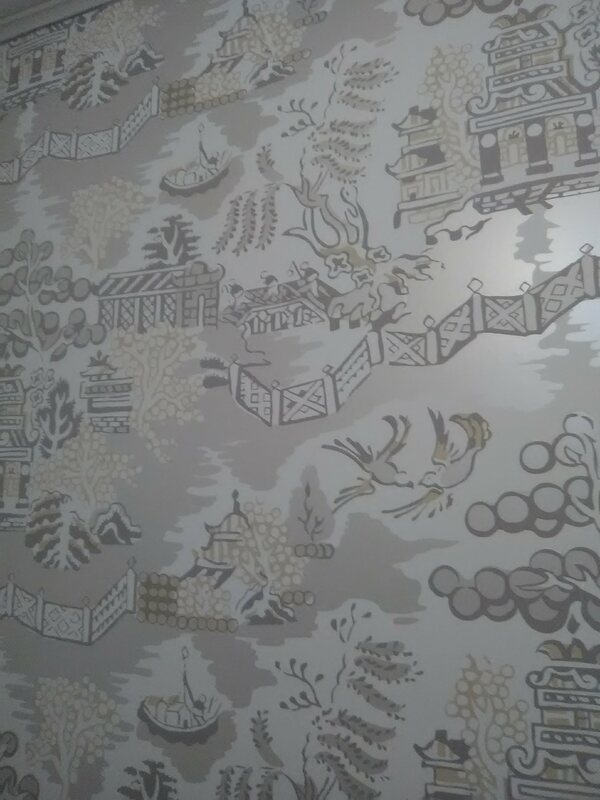 She zeroed in on this “Lafayette” design by Thibaut, and she was spot on… this paper really transformed the room! This 1960’s / ’70’s home in the Tanglewood neighborhood of Houston has elegant finishes and furnishings, and has been immaculately cared for over the years. The homeowner has a great many items that date back several decades. So this paper is well-suited…. 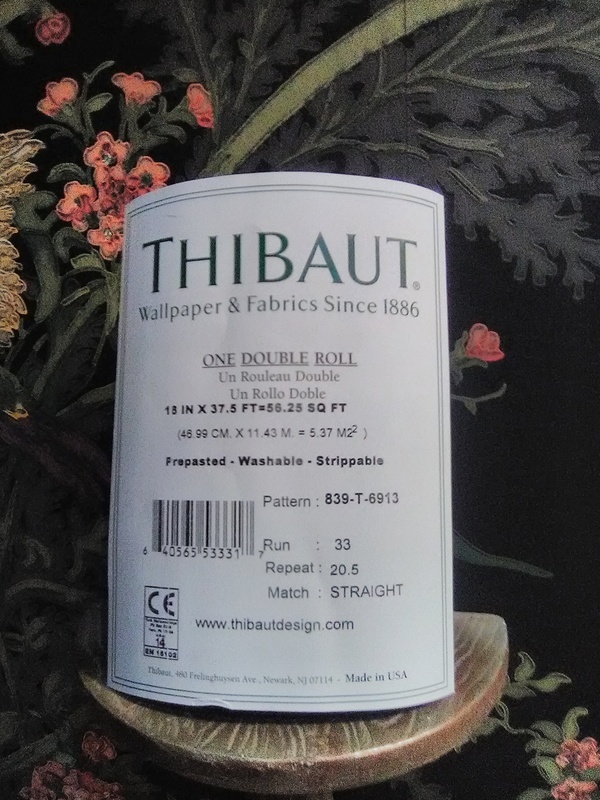 From the Historic Homes collection by Thibaut, it dates back to the 1800’s (Thibaut was founded in 1886). 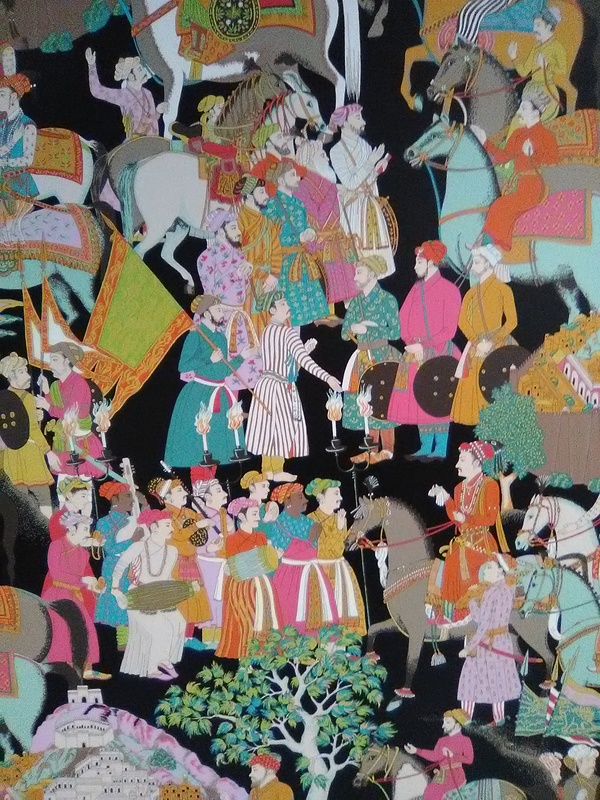 Most wallpapers are 20.5″ wide, but this one is 18.5″ wide, which is because, I am told, it is printed on the exact same printing presses that were used back in the days of the original production (1800’s). 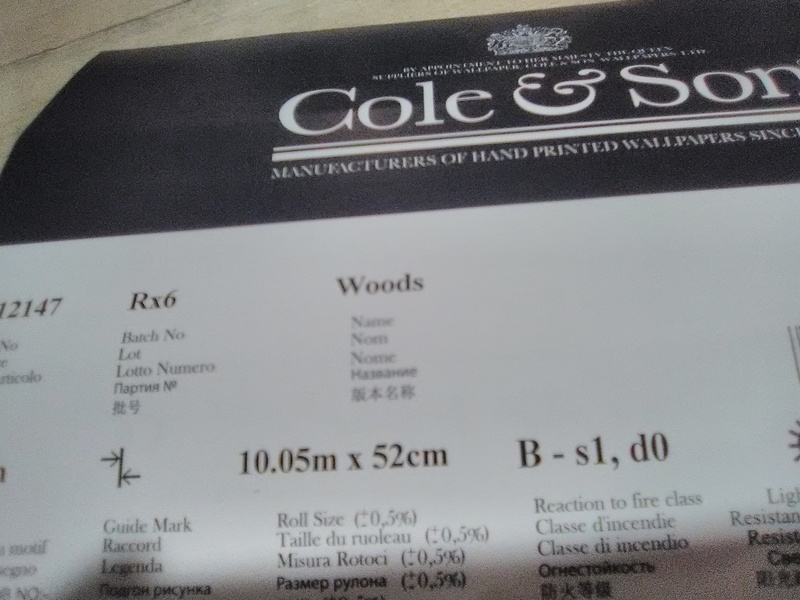 It has a beautiful raised ink method of printing, and is lovely to work with. Look at tomorrow’s post to see a better pic of the true colors of this gorgeous pattern! 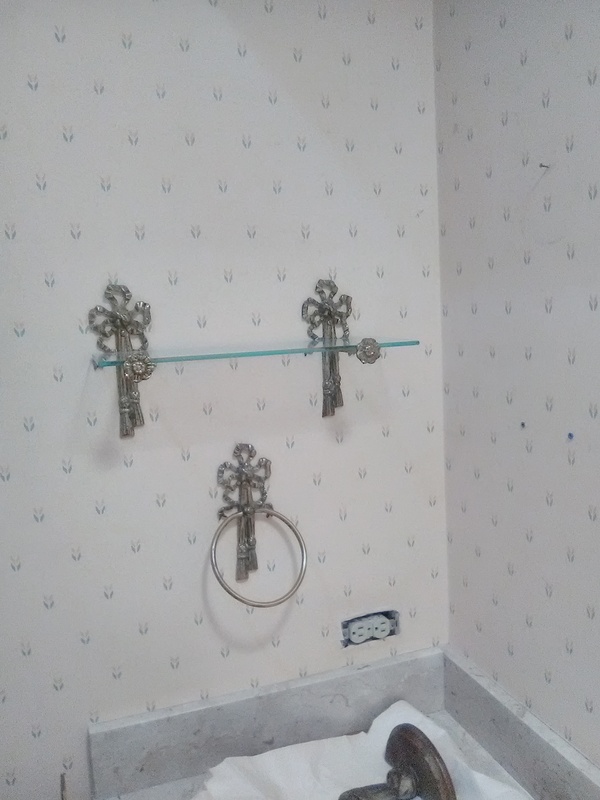 Originally, this powder room in the Galleria / Tanglewood area of Houston had what I call a “ditzy” print on the walls – tiny little figures that repeated themselves all over the wallpaper like a zillion little dots lined up in rows. 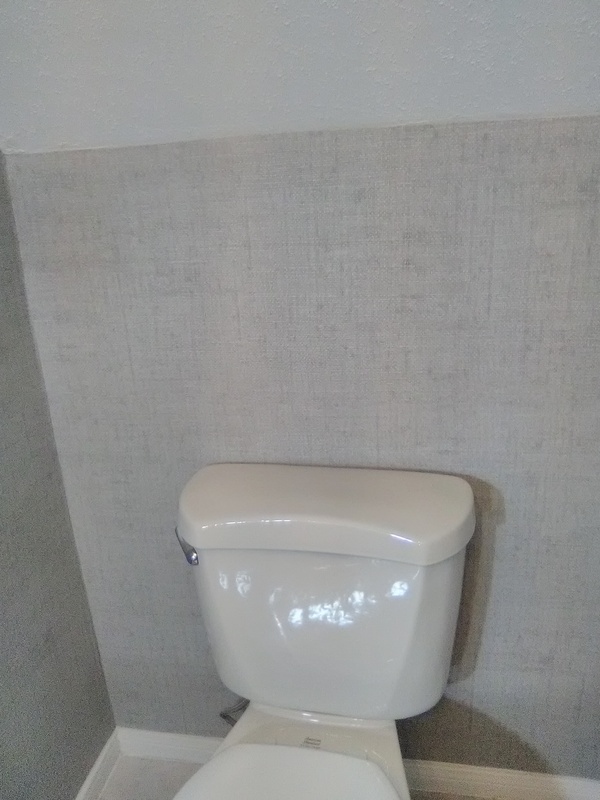 It was outdated and discolored, and didn’t fill the wall space well. The new homeowner wanted something modern and serene, that would be durable in an area that’s exposed to water. 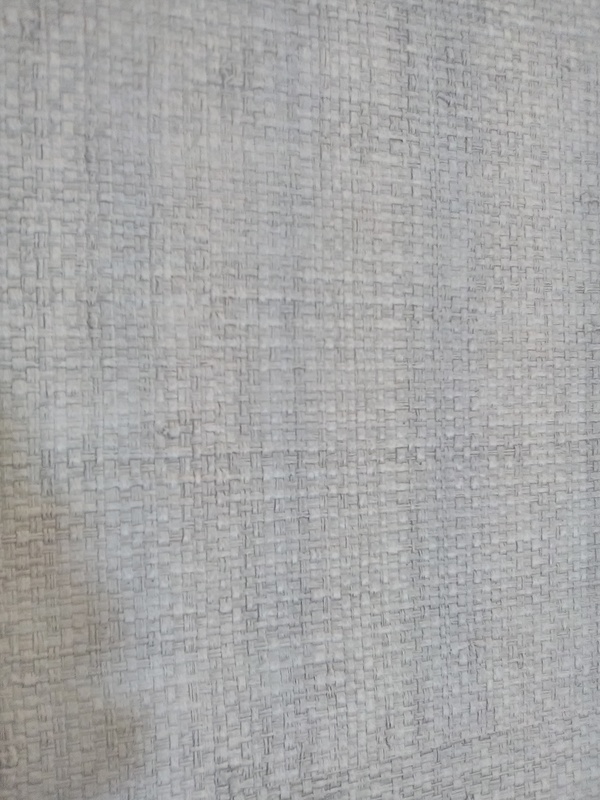 This Bankun Raffia in a steely medium grey is perfect. I am not a fan of real grasscloth (read the page to the right). Nor do I like solid vinyl wallpapers (see the page to the right “Stay Away From ….). But this is one vinyl paper of which I approve. The vinyl surface is thick and embossed with texture, so it mimics the feel and look of real grasscloth. But it has none of the color variations and shading / paneling issues or visible seams that make the real stuff so disappointing. In fact, you can hardly find a seam. 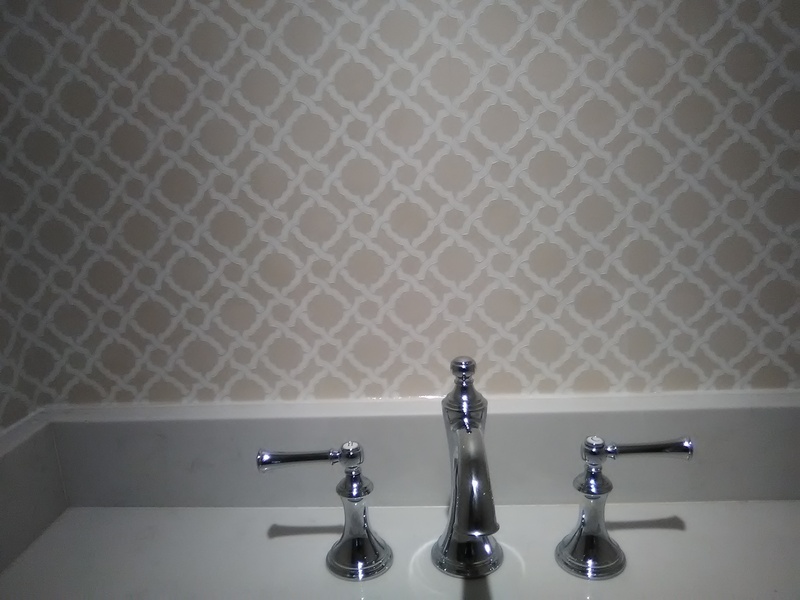 The vinyl surface is a lot more resistant to water and stains than most any other type of wallcovering. And the woven fabric backing won’t absorb humidity and curl or delaminate like the lower-end paper backed vinyls will. 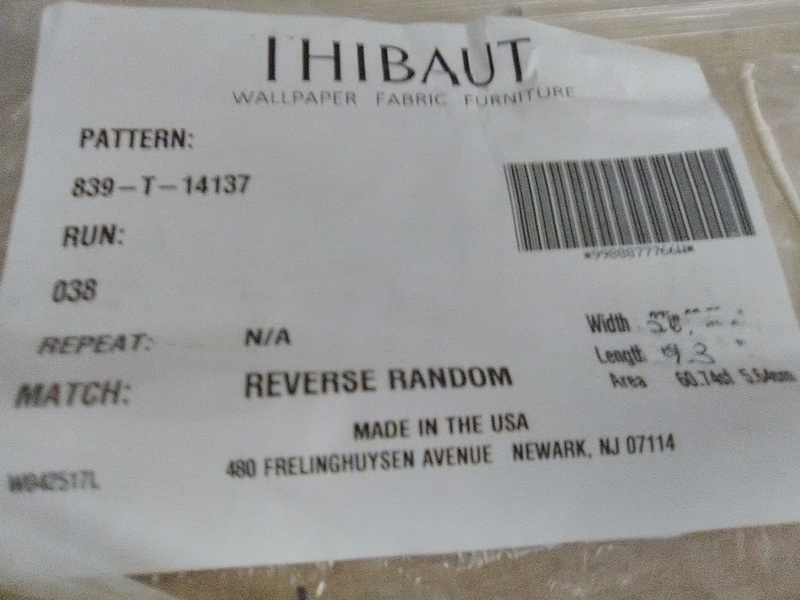 And that fabric backing makes this product quite durable and strong, and resistant to tears (like you see when a home’s foundation shifts and the corners twist out of alignment). In fact, this stuff is the same iron-tough material that is used in hotels and hospital corridors, and will withstand dings and bangs and can be cleaned easily. Being thick and stiff, it is a bit difficult to work with, particularly when turning corners. But the benefits are worth it. 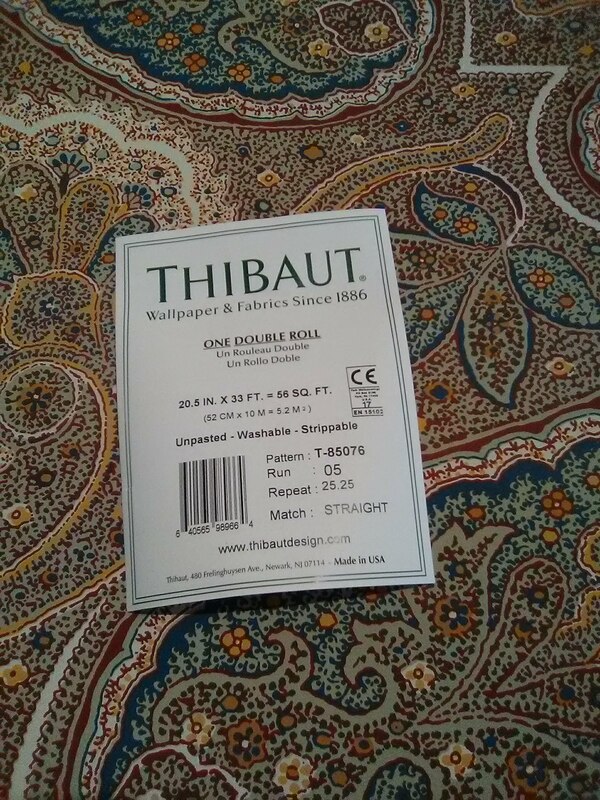 This wallpaper pattern is called Bankun Raffia. It is so popular, now it comes in more than 30 colors! 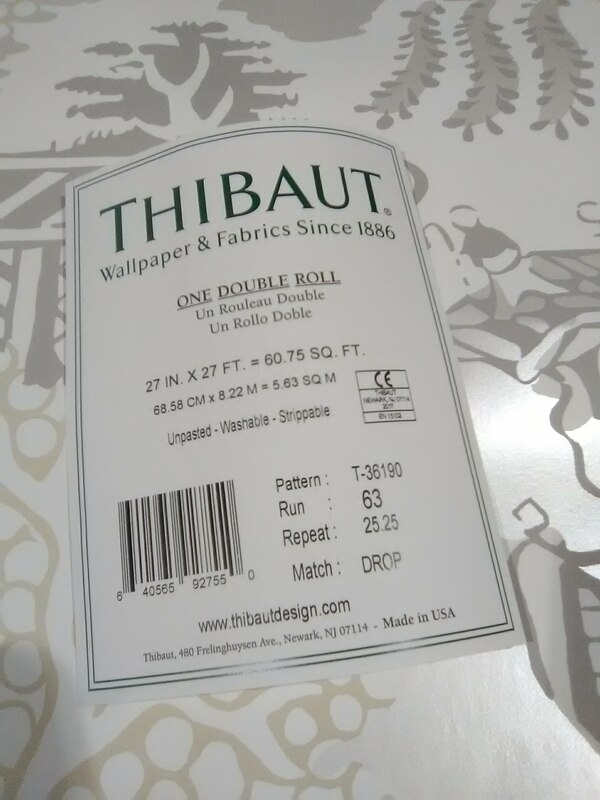 It’s by Thibaut Designs, and was bought from my favorite source for good quality, product knowledge, expert service, and competitive price – Dorota Hartwig at Southwestern Paint on Bissonnet near Kirby. (713) 520-6262 or dorotasouthwestern@hotmail.com. She is great at helping you find just the perfect paper! Discuss your project and make an appointment before heading over to see her. This homeowner is a mountain climber, and goes every chance he gets. He wanted to bring a little of his passion into his home, and this rear wall of his closet was the lucky spot. 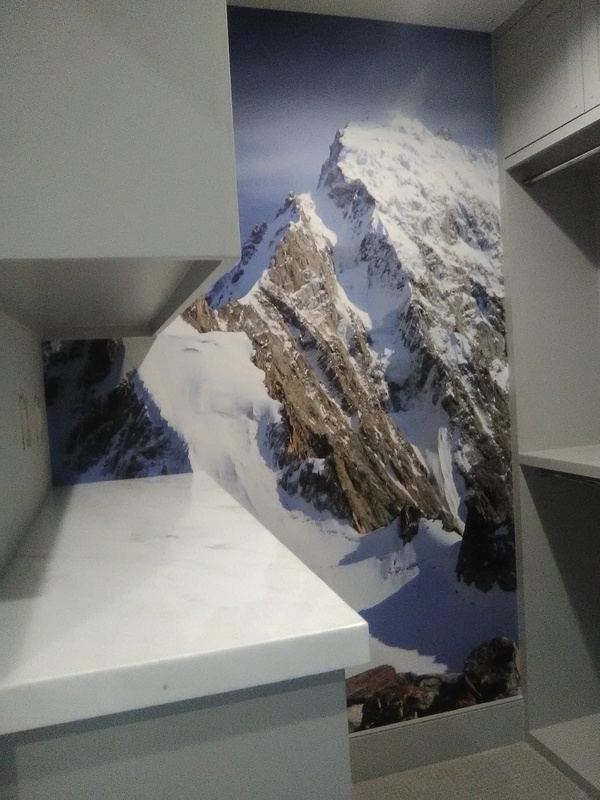 A lot of the mountains and sky were cut off where the cabinets hit the wall, but you see enough of the photo to feel like you are there! 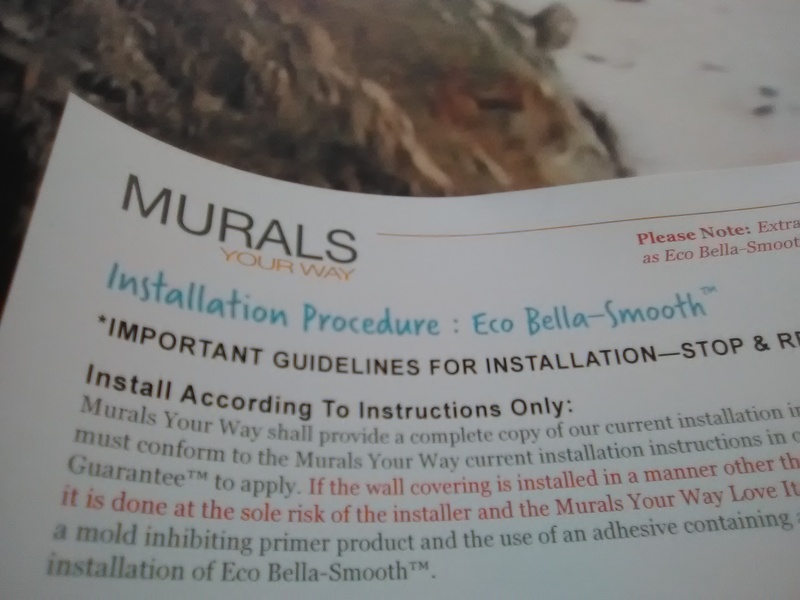 The mural is by MuralsYourWay.com (who happen to be fellow members of the Wallcovering Installers Association). 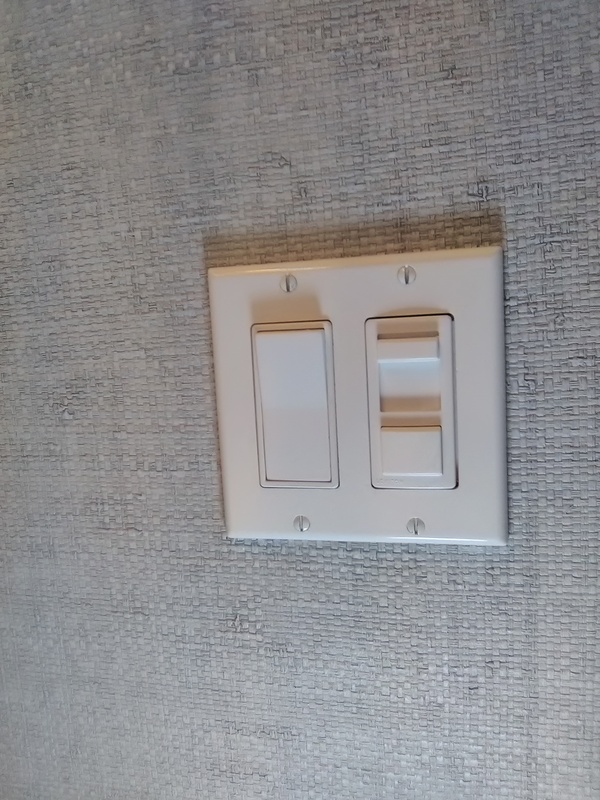 It was custom-sized to fit the wall (allowing a 2″ “bleed” all around each side). 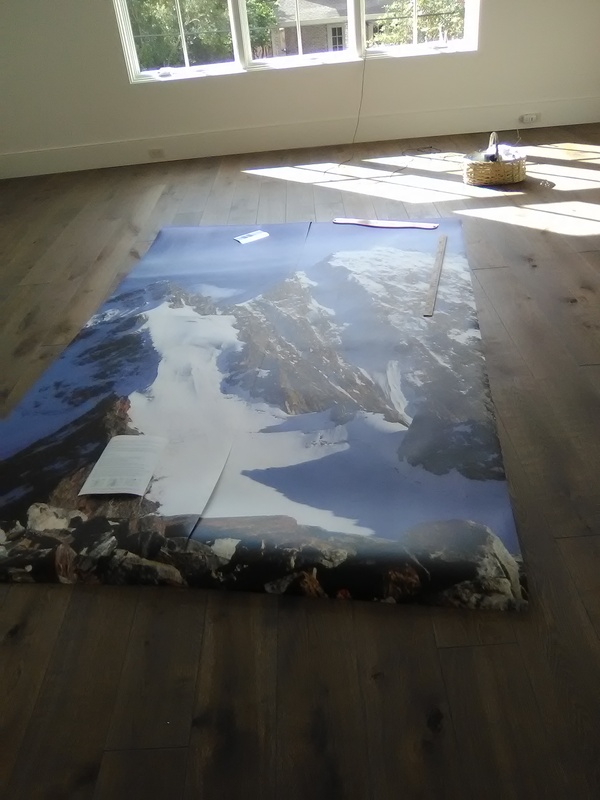 It came on a heavy vinyl material with a canvas backing, and was pretty thick. That made it a little difficult to trim. There was one seam, and that was double-cut (overlapped 2″ and then spliced). 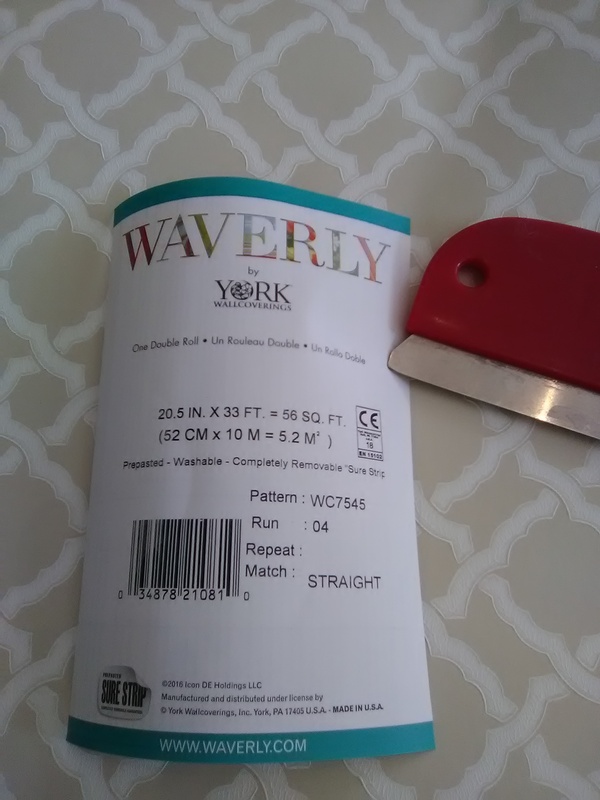 Since the material was so thick, and with the fabric backing having threads that got caught up in the seam, it was somewhat difficult to cut – I used a new single edged razor blade and had to press really hard to get through both layers. I used a thin polystyrene plastic strip to pad and protect the wall under the cut, so the drywall would not be damaged (cut drywall can delaminate and result in a popped seam. I also used blue plastic tape on the edge of the overlapped piece, to prevent paste from getting on the face of the mural. The wide strip on the left would have been unwieldy trying to fit around the upper and lower cabinets, and the material was prone to creasing. So, I split the strip in half vertically, so the first half went to just an inch past the cabinets. 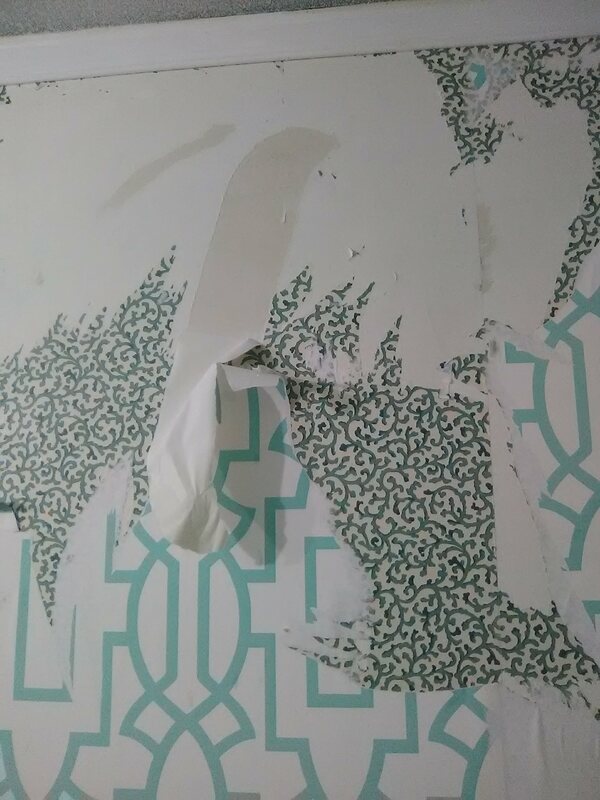 This was much easier to manipulate, and put less stress (potential damage) on the paper, plus it kept paste off the cabinets. Then I was able to easily position the short piece that went in between the upper and lower cabinets. This is a new construction home in the Tanglewood area of Houston. I was lucky enough to work all by myself, with no other construction workers in the house. No noise, no distractions = happy. This hall bathroom in a 1955 home in the Briargrove / Tanglewood neighborhood of Houston suffered damaged during Hurricane Harvey. 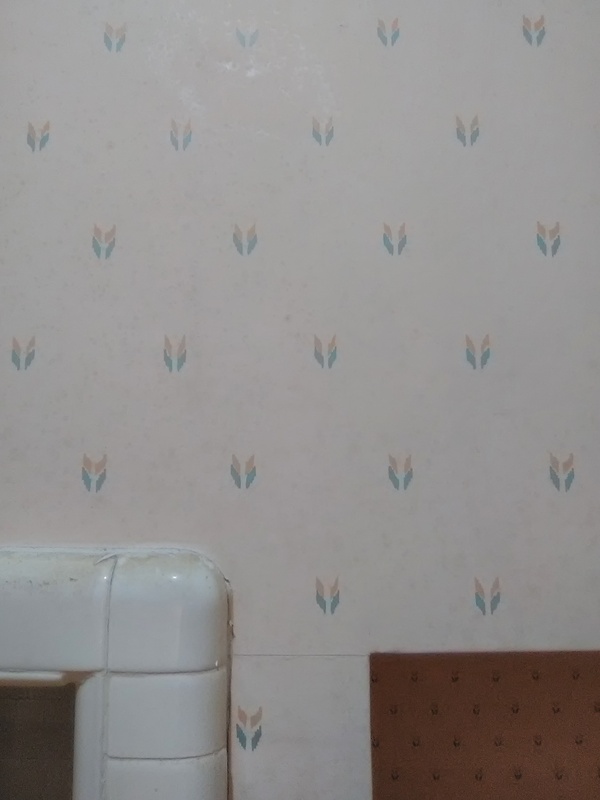 The wallpaper had to be replaced. 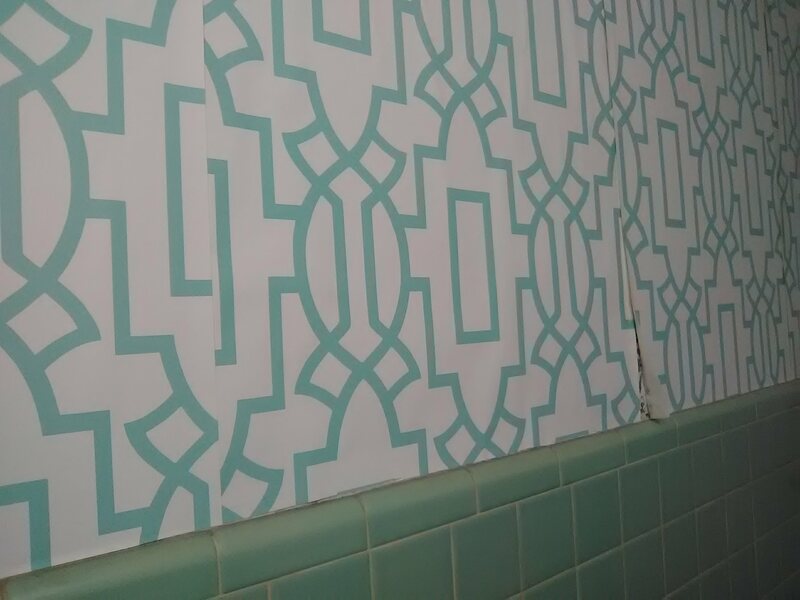 The homeowner chose the aqua trellis paper, thinking it would compliment the original sea-foam colored tile (which I happen to love, BTW). 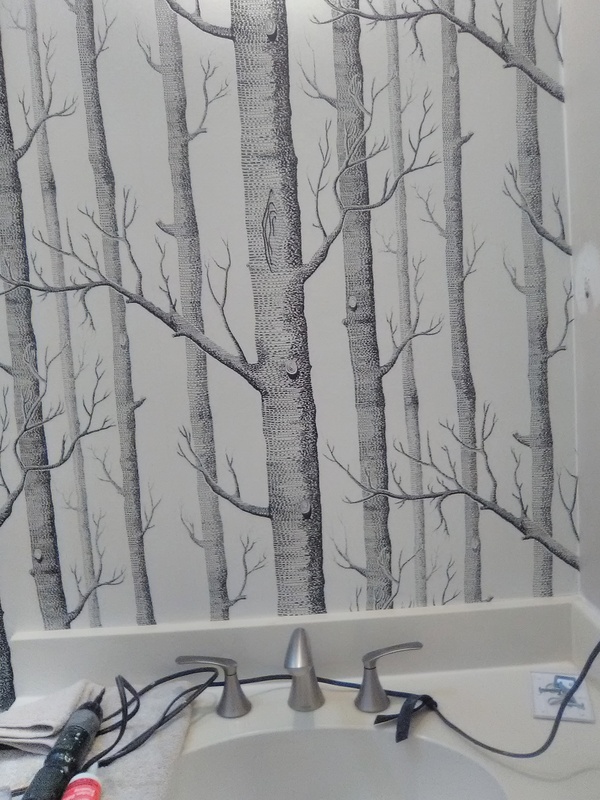 The contractor let his painter hang the new wallpaper. Both these decisions turned out to be mistakes. 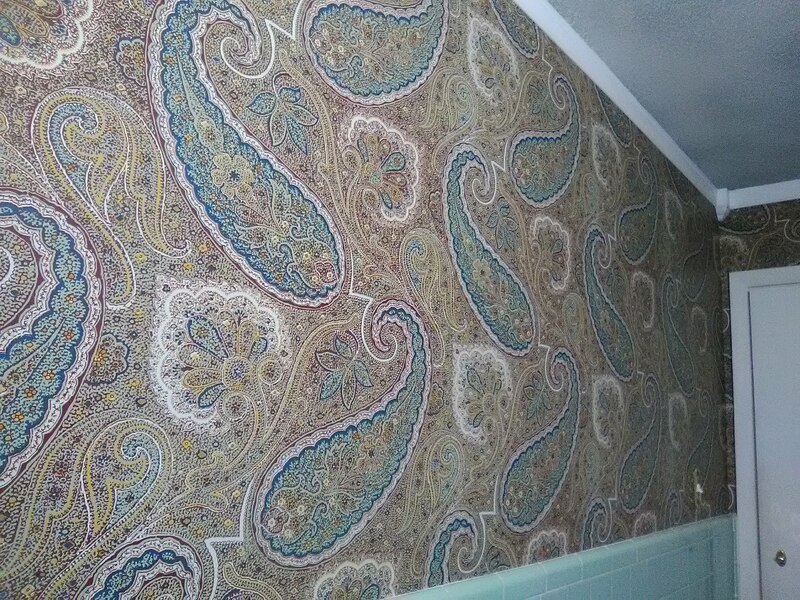 I was called in to remove the trellis paper, prep and prime the walls, and then hang this beautiful and bold paisley pattern. Some of the photos are washed out, but in the good ones you can see the rich hues of this fun pattern. And it coordinates perfectly with the tile. This hall bathroom in a 1955 ranch-style home in the Briargrove / Tanglewood neighborhood of Houston was damaged by a roof leak during Hurricane Harvey. 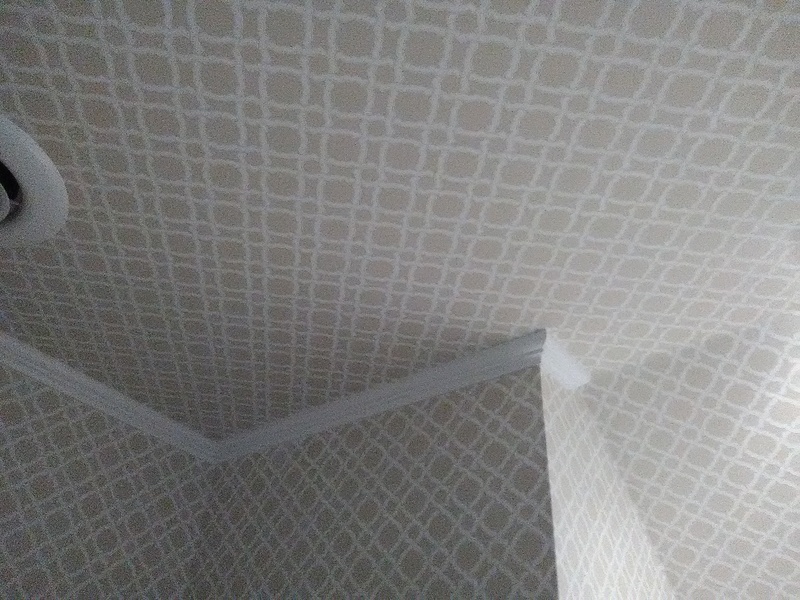 The contractor’s guys did a good job replacing drywall and painting the woodwork, but they fell short when it came to wallpaper. See first photo. 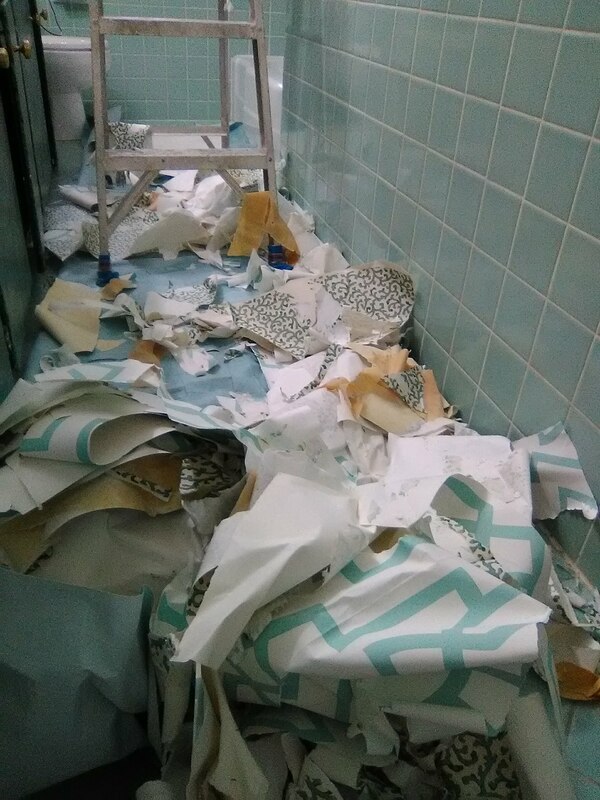 But this just gave the homeowner a chance to choose something that coordinated better with the decades-old tile that she loves (and that I love, too), and to pick a paper with more color and flair, that is more suited to her taste. See tomorrow’s post for that. 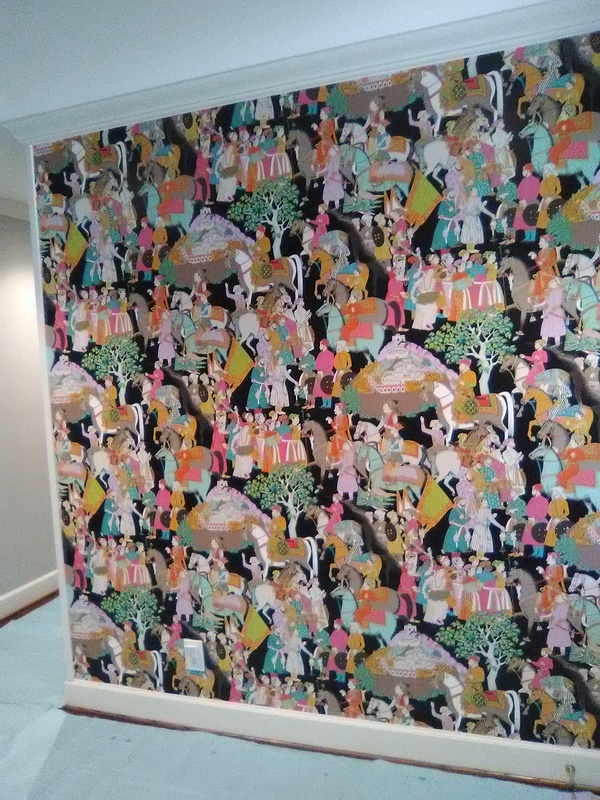 My first task was to remove the existing wallpaper. It turned out that there were two layers of paper, and, in some places, THREE layers. This paper was attached more tightly to the wall. To remove it, I had to first separate the top inked layer from it’s paper backing. You can see this in the second photo. Once the top layer, with it’s water-resistant acrylic surface was removed, it left behind a white paper backing. I used a sponge and bucket of hot water to soak the backing. 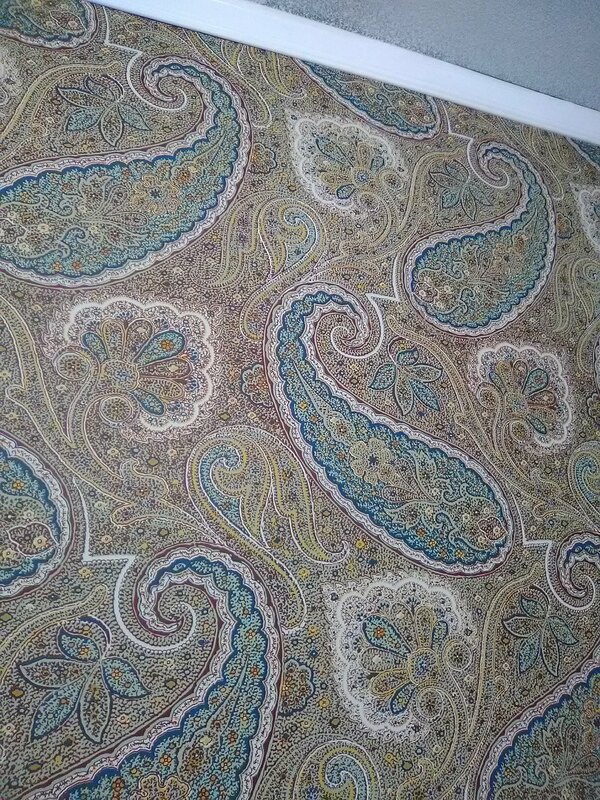 It didn’t take long before the underlying paste reactivated, and then it was ready to let go of the wallpaper. 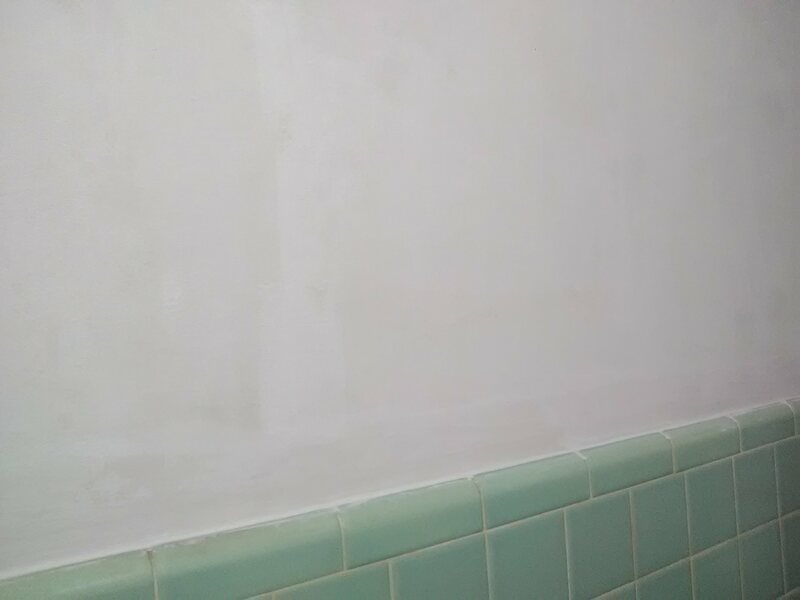 You can see clean wall revealed in the photo, where the layers of wallpaper have come away. In one area of the room, I got a surprise. 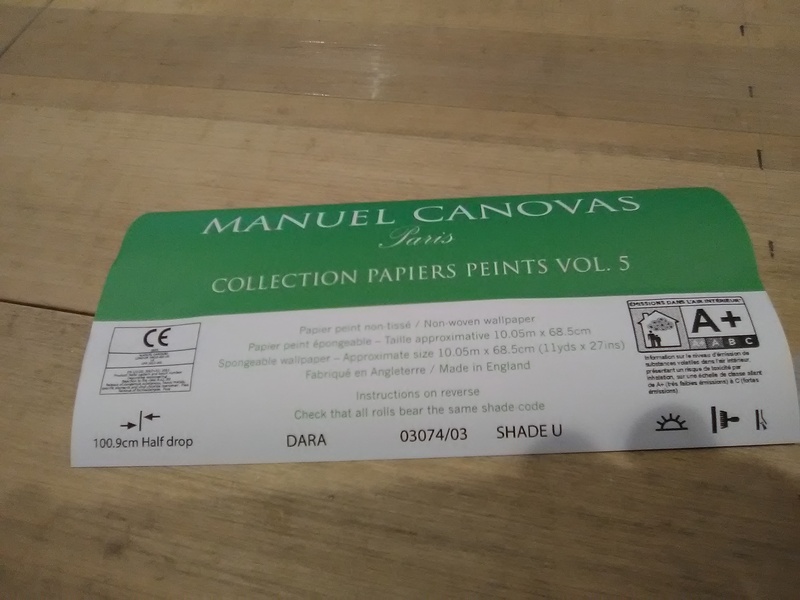 There was a third layer of paper under the others. The top vinyl layer had been stripped of eons ago, but the tan, gritty paper backing was left on the wall. You can see this in the third photo dry (light tan) and soaked with water (dark tan). 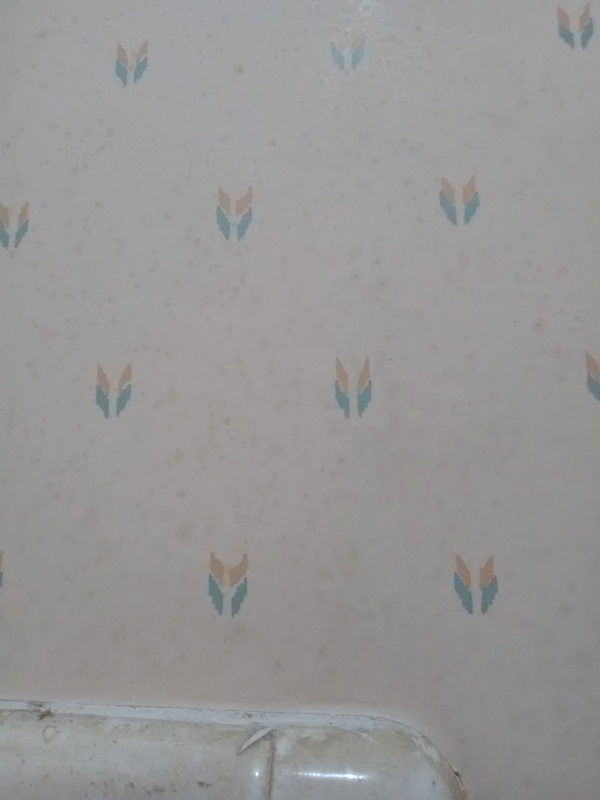 Once that tan paper backing got soaked enough with several spongings with hot water, the paste reactivated and the paper was happy to come away from the wall. 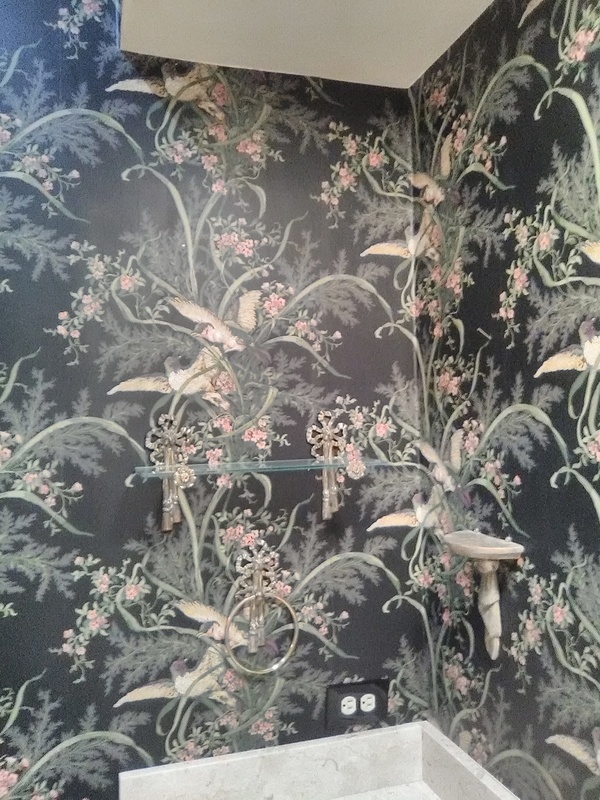 I was uncommonly lucky today, because whoever hung the original wallpaper had taken the time to prep the walls correctly. First, he skim-coated the textured walls to yield a smooth surface for the paper to adhere to. Second, he applied good quality penetrating sealer. This sealer might have been Gardz, a product that I use now, or another similar sealer, perhaps even a solvent-based (as opposed to water-based) sealer. 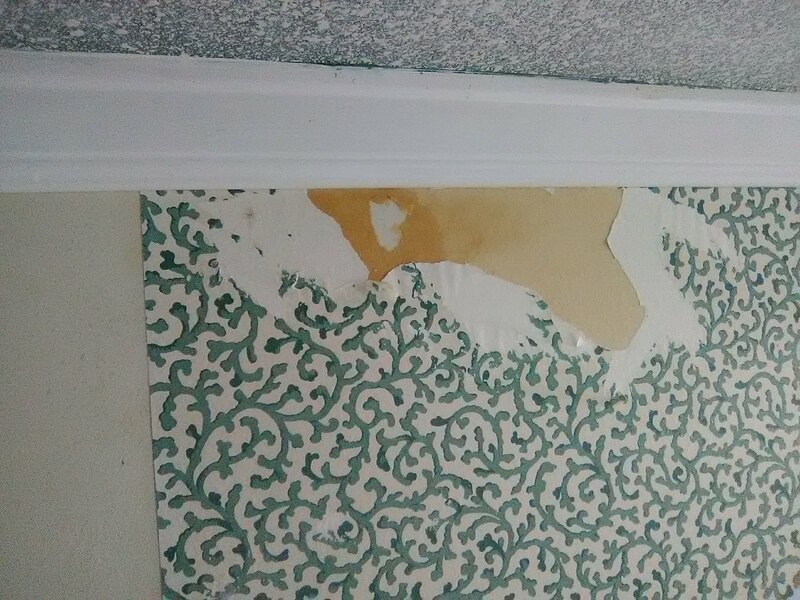 His sealer provided a hard surface for the new paper to stick to, and also gave a surface that was resistant to all the water I was using to strip off the old wallpaper. 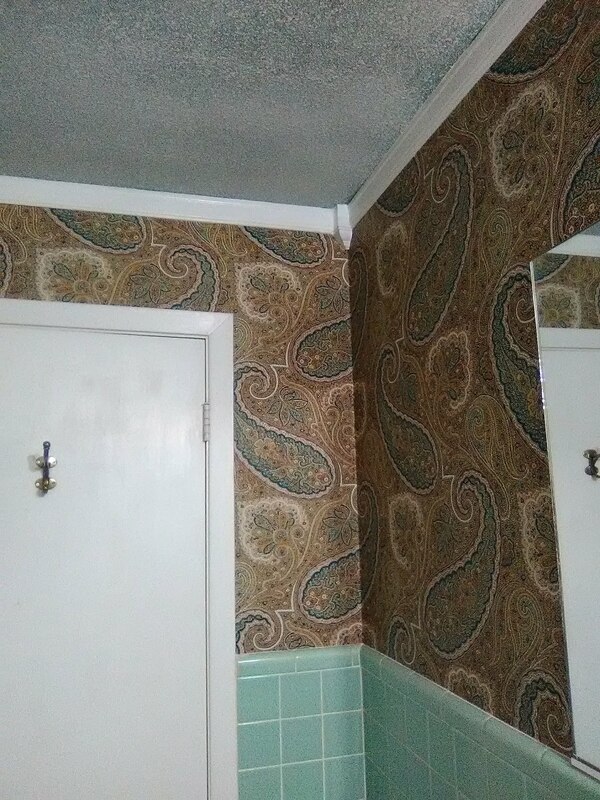 Check out the fourth picture to see the huge pile of wallpaper I pulled off this one small hall bathroom. Once all the paper was off, the walls were in very good condition. There were no delaminated areas, no lifted areas, nothing that needed patching – just an amazingly intact surface. 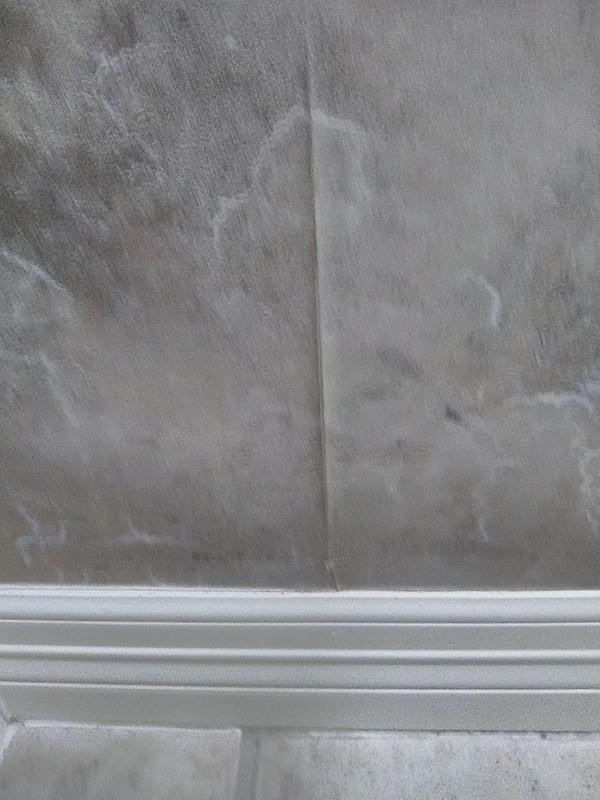 I did a few little touch-ups to a few little areas (I wanted to clean up 60 years of grime collected along the top of the tile), and then rolled on my favorite wallpaper primer, by Roman’s, their Pro 977 / Ultra Prime. It’s a white pigmented primer, and is a wonderful surface to hang wallpaper on. 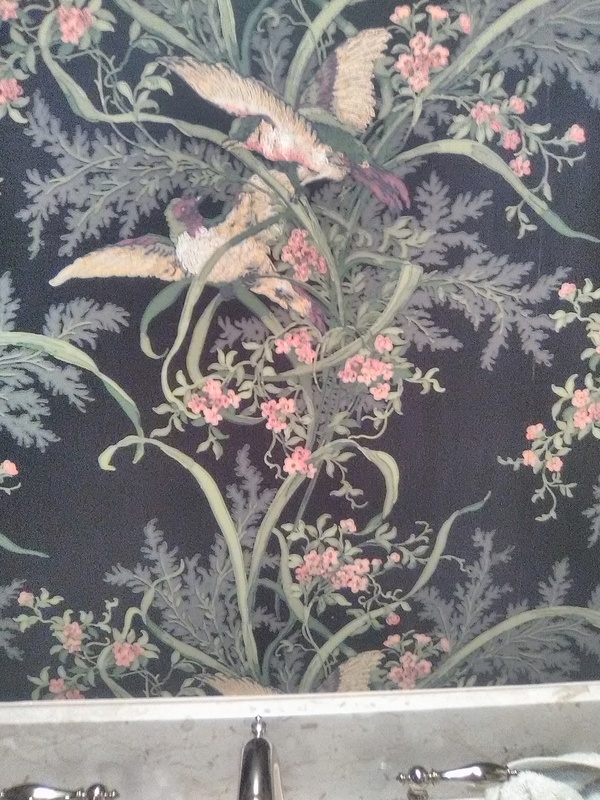 Chinoiseries (Oriental-themed patterns) date back hundreds of years. But they can be adapted for modern tastes, too. The muted colors and pearlized shimmer of this design by Thibaut fit right in with this young couple’s furnishings and with the architecture of their Briargrove (Tanglewood) area home in Houston. The largish powder room originally had a Venetian plaster type finish on the walls, and it was painted a glossy one-color grey. Suffice it to say, the room was downright unattractive. I smoothed the walls and applied a primer. 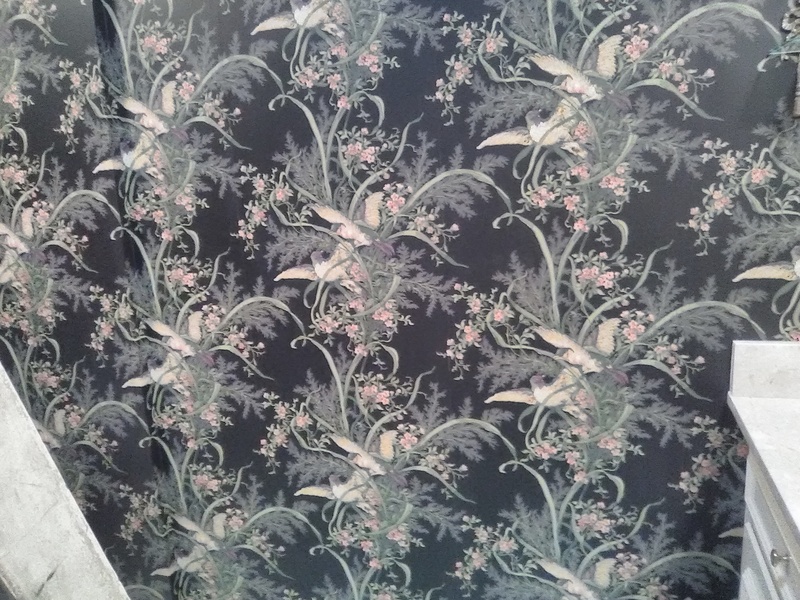 As the paper started to go up, the homeowner exclaimed, “I didn’t expect the wallpaper to make the room look bigger. But it DOES!” She also loved the pattern, and the oh-so-very-subtle pearly sheen.